Australia batsman Usman Khawaja feels the visitors will need to adapt to the conditions in India if they are to do well in the upcoming series. Australia batsman Usman Khawaja feels the visitors will need to adapt to the conditions in India if they are to do well in the upcoming series. He also added the team members need to learn from their past experiences in the country. The Aussies kick off their India tour with the first T20 at Visakhapatnam on Sunday. “I played in that T20 and the wickets were really nice. I found there was probably one wicket that spun a fair bit in Dharamsala, the other ones in Mohali and Bangalore were pretty good batting surfaces. 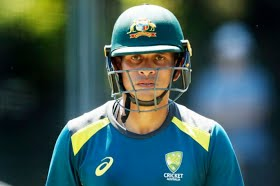 You just have to adapt to whatever you get here,” Khawaja was quoted as saying by cricket.com.au according to a PTI report. Khawaja added that some from the team have performed well in India so that will also help thee team’s cause. “There’s a lot of good players in this team, which is awesome. It’s good to have options. “A lot of guys that are in this team are quite flexible on where they can play so whatever happens moving forward I think everyone will do quite well in whatever role they have,” the left-hander opined. The two-match T20 series will be followed by five one-dayers.